Check out a Tabby Cat Slideshow! Tabby cats may be extremely common, but that doesn't make them any less popular than other color patterns. Learn just what makes a tabby a tabby and why this is one of the most beloved cat types out there. 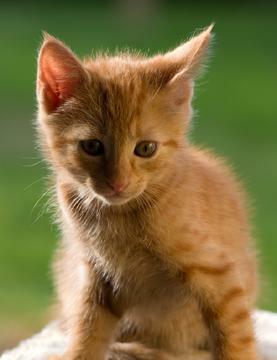 Some people call all cats "tabbies", using the word as a synonym for cat. Strictly speaking, tabby cats aren't actually a specific breed of cat. Tabby is actually a coat pattern, and it's thought that if cats were allowed to breed indiscriminately, more than half of the cat population would be tabby. Stripes and whorls are simply part of a cat's makeup. Some tabby cats are varicolored - that is, they have some tabby patches on a mostly white coat, or orange and brown tabby patches mixed on a white coat. Oddly, these variations only occur on an otherwise white-coated cat. That is, you simply don't see tabby patches on an otherwise black cat. No one knows why this should be. The most common pattern for a tabby cat is tiger-striped, less commonly referred to as a "mackerel tabby". This terminology isn't obvious until you consider that the stripes resemble the bones of a fish. Tabbies are often "dressed up" with white paws and perhaps a white bib. Another tabby pattern is the blotched tabby, also (confusingly) called the "classic tabby". This is characterized by swirls, and the rings around the legs and tail are often much wider than the rings of the mackerel tabby. Less obvious patterns such as the ticked pattern of the Abyssinian (with fur ticked like a squirrel's) are also considered tabby, but many consider inclusion of this pattern a bit of a stretch for the common tabby type. One of the most interesting variations is a cat with Siamese coloring and tabby points; that is, the fawn-colored body and face, with legs and tail showing faint or distinct tabby markings in the point coloration. Tabby cats have unusual and attractive facial markings, similar to the tiger's. Most of them have what can be seen to be a letter "M" on their foreheads between their ears, and a number of legends have arisen to account for this. The "M" has variously been supposed to have been bestowed on a favored or brave cat by either the Virgin Mary or the prophet Mohammed. Never mind that neither of these figures would have been familiar with the English alphabet. Tabby eyes have the long stripe of "eyeliner" on the cheek, similar to the Egyptian symbol, the 'Eye of Horus' (also known as the Eye of Ra), and it is possible that the sign was adopted from the cat which was revered in Ancient Egypt and often mummified and buried with its owner. Whatever their origin, tabby cats are exceedingly popular, and it's doubtful the world will ever see their decline.